From Kroger's Family of Stores & General Mills via MyBlogSpark: You’ve seen the Biggest Loser on TV, watched contestant’s struggles and achievements, and may have even thought, “Hey, I can do that!” Instead of waiting for the BBQs to be over and your schedule to open up, put all excuses aside and make a pledge to live healthier with the Pound For Pound Challenge. The Kroger Co. Family of Stores, General Mills, NBC's hit TV Show “The Biggest Loser” and other key sponsors are partnering to donate up to $1,080,000 to Feeding America this year. - Visit www.pfpchallenge.com/Kroger to make your pledge to lose weight and to get more information and to find tools to change your life for the better. It is free, easy and only takes a minute to make a change that can help you and help the hungry in your local community. - Through June 30, 2010, for every pound you pledge to lose, the Pound For Pound Challenge will donate 14¢ to Feeding America® — enough to deliver one pound of groceries to a local food bank. As the official supplier of the Biggest Loser Ranch and partner of the Pound for Pound Challenge, the Kroger Family of Stores wants to help you achieve your goals. If you’re a fan of the Biggest Loser, you may have seen several great General Mills products featured on the show. These products, including Yoplait Greek yogurt, Total, and Multigrain Cheerios, are available at your local Kroger Family of Stores and can help you stick to your weight management plan. One of my lucky readers will win $30 in Kroger Family of Stores gift cards that you can use to purchase the General Mills products that have been featured on the Biggest Loser from the Kroger Family of Stores** through MyBlogSpark. ** The Kroger Family of Stores includes Kroger, Fred Meyer, Ralph’s, King Soopers, City Market, Dillon's, Smith’s, Fry’s, QFC, Baker’s, Owen’s, Jay C Food Stores, Hilander, Gerbes, Food4Less, Pay Less Super Markets and Scott’s Food & Pharmacy. Want to win? Here's how! The drawing will be held June 30th. Winner: I will send you an email, please reply with your address so I can forward it to the wonderful people at MyBlogSpark! This giveaway is open to residents within the United States, no PO Boxes. The Kroger Family of Stores and General Mills were very generous and provided me with a $30 gift card and information through MyBlogSpark, and they are allowing me to host a giveaway for one additional gift card to a reader! My Thoughts: I think this is a wonderful new tradition to add to my family! Based on an old German tradition of Schultüte that Vivian Lie (founder KinderCone) has made easily adaptable, it helps us celebrate things like the first day of school, which can be scary for kids. The KinderCone is a sturdy and colorful cone that comes pre-filled with a journal for First Grade, a cat stuffed animal that is featured in the journal, pencils, temporary tattoos, and a numbered certificate (each theme is limited to 2500, which helps to make the cones even more special). When the Red and Orange KinderCone arrived in the mail, I was so excited to see my son's reaction to it. He squealed and hugged it, then immediately pulled open the bow and started pulling things out, exclaiming over each thing. I can just imagine how great this will be to use on the first day of school... it will surely engage my son as well as his new friends! As a parent, it will be easy to further customize by adding treats for my son as well as his friends (erasers, candy, stickers, etc). In all, the cone is a great way to keep track of special moments from your child's First Grade year (thanks to the included journal), as well as a great way for your child to make new friends by sharing pencils and temporary tattoos with other children. This would also be a great gift to send with your child to camp, just fill it with some fun treats for your child to share. The KinderCone can also be purchased as a pre-decorated, limited edition cone that you can fill yourself, or as a Craft MiniCone, that you can help your child to decorate (great party idea!!) and fill! I hope to use the Craft MiniCones for a party in the near future - what a great way to build fun memories and send home a really fun "goody bag." *I'm finding it hard to stop imagining new ways to use the cones! Starting first grade marks a milestone in every child's life. While the prospect of learning and meeting new friends proves exciting for both children and their parents, embarking on something so new and unfamiliar can feel daunting, too. 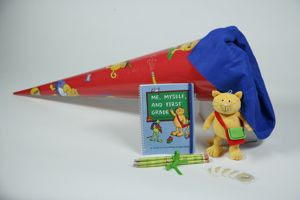 To help make this transition easier and more fun, young children in Austria and Germany are given a Schultüte, a cone made from sturdy, colorful paper and filled with treats and school supplies, as they leave home for the first day of first grade. Born and raised in Munich, Germany, Vivian Lie was eager to share the tradition of Schultüte with others when she moved to the United States. In 2008, she founded KinderCone to spread the word about this 200-year-old tradition and to provide families with the opportunity to surprise their own children with Schultüten on their first day of school. With a variety of color themes and sizes, KinderCones make a wonderful back-to-school gift for any child, regardless of age. 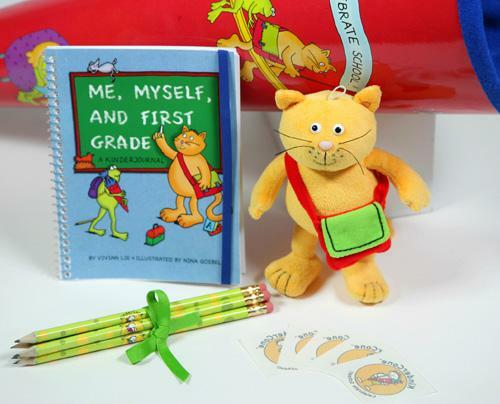 Includes: KinderJournal: Me, Myself and First Grade, Karli the Cat plush toy, 5 KinderCone pencils, KinderCone temporary tattoos and a limited-edition certificate. Hand-made in Germany of recycled sturdy paper. KinderCones are 28 inches tall with a convenient hanging loop. Each KinderCones is enclosed with colored felt on top and tied with our special ribbon; choose from 8 color options. Every KinderCone comes filled with our exclusively written 5x7 KinderJournal, Karli, the cat, five pencils, temporary tattoos and a limited-edition certificate. Make sure to celebrate school in a personal way and add you own small gift or note to tell your child just how proud you are! Edition Reviewed: I wrote this review while participating in a blog tour campaign by Mom Central on behalf of KinderCone and received a red with orange top KinderCone sample to facilitate my review. Mom Central also sent me gift certificate to thank me for taking the time to participate!